At the end of September, Penn State Football appeared ripe for mediocrity. One blocked kick against Ohio State brought them back to the surface of national relevancy. One blocked kick returned for a touchdown that toppled the potentate of the Big Ten launched Penn State into the conference title game where Wisconsin was waiting. We all knew the day was coming, but no one could have predicted in this way. Since 1950, Joe Paterno has been a fixture on the Penn State sidelines, and upon entering his 62nd season on the coaching staff, everyone knew that this octogenarian’s days as head coach were growing slim. Our inaugural College Football Tour Northwestern tailgate took place with Joe Paterno’s Nittany Lions charging into Evanston. A variety of Big Ten fans were represented as we set up a few blocks from Ryan Field to experience a perfect autumn afternoon tailgate. After a few footballs and bean bags were tossed, dusk began to take effect and the temperature took a dip. We walked over to an brightly illuminated Ryan Field ready for this Big Ten clash. Halloween. Tricks. Treats. The night was set for a major Big Ten matchup. Northwestern was hyping this game up calling it Purplepalooza and calling on all Wildcats fans to purple it up. Purple ponchos placed at every seat ensured this, as well. But, a ghostly white would be the most frightening color on the field this evening. A week after the Badger band was suspended from playing at Camp Randall Stadium, the fire and excitement returned as “On Wisconsin” blasted proudly while the Badgers entered the stadium. For this prime time contest with white towels waving, fans foaming at the mouth, and the band high stepping again, that fire would be put out quickly by a powerful Penn State squad. The wheels have come off the Bucky Wagon and Penn State holds the lug nuts. On homecoming weekend in Happy Valley, the Badgers played like they ate too much Peachy Paterno ice cream over at the Berkey Creamery. From the first play, it became clear to those wearing red that this Saturday would be a long one. Star tailback P.J. Hill fumbled on the opening play for Wisconsin and Penn State only needed three plays to capitalize. The 109,754 that crammed inside Beaver Stadium would enjoy a stunning blowout of the ranked Badgers and looked to be turning a major corner on their season. Usually, when legendary head coach Joe Paterno brings his Nittany Lions to a stadium, tickets are sold out weeks in advance. Add a Big Ten opener to the mix and you may as well set up camp on the couch. But, not unless it’s Penn State at Northwestern. Ryan Field has to be the only team that wouldn’t fill even half their stadium in such a situation. Northwestern’s fan base is extremely fair weather. The slightest cloud in the way will keep them home. 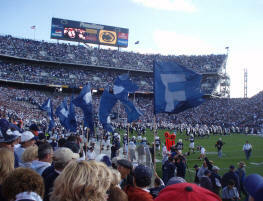 A large portion of the fans traveled from Pennsylvania, as well. Wildcat fans have their good moments, but this day certainly was not a day to allure new recruits. Seriously, some fans actually stretched out on their bleachers and grabbed a few snoozes at halftime. Ridiculous. As of September 21st, the Badgers had matched their win total from last year. Such a statistic as this only inflates expectations. This undefeated Wisconsin squad trekked along a rocky path to get to this point – more like boulders falling from above. Slim margins of victory over feeble opponents caused hearts to palpitate in irregular fashions. However, impressive triumphs also accompanied their win streak providing the confidence they needed versus their Big Ten opening opponent, Penn State. Since the season’s inception, Penn State’s headman and college coaching legend, Joe Paterno, needed one victory to tie the record with Paul “Bear” Bryant for the most wins ever recorded by a Division One head coach. As November loomed a short distance away, Paterno still had not managed to dent the win column. His 0-4 Nittany Lions had struggled in a fashion unlike any of his other teams since his first year coaching Penn State in 1966.